The 2016 class of the Hockey Hall of Fame has been revealed, with the 18-member selection committee announcing the induction of Eric Lindros, Sergei Makarov, Rogie Vachon, and Pat Quinn. The induction ceremony with take place on November 14 at the Hockey Hall of Fame in Toronto. For many, the induction of Lindros settles a debate as to whether or not he was one of the league’s elite players. In 431 career games from 1992 to 1999, Lindros had 600 points. In 48 playoff games, he had 56 points. Of course, the start of Lindros’ NHL career was less than ideal. He was drafted first overall in the 1991 NHL Entry Draft by the Quebec Nordiques, but he refused to report to the team and was traded to the Philadelphia Flyers for a package of players that included Peter Forsberg. 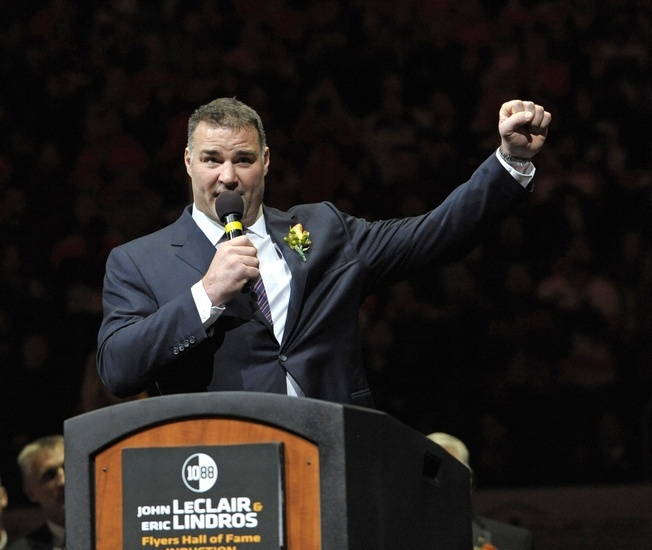 Lindros debuted for the Flyers in the 1992-1993 season and went on to enjoy a formidable career, despite injuries causing him considerable trouble. He won the Hart Memorial Trophy and the Lester B. Pearson Award after the 1994-1995 season. Makarov, the Chelyabinsk-born right-winger, didn’t join the NHL until 1989 after spending extensive time in Russia. He won the Calder Trophy at the age of 31, which subsequently caused the league to change their eligibility rules. Makarov was trained in the Soviet Union and won two World Junior Championships. He won gold with the Soviet Union at the World Championships eight times and secured gold at the Canada Cup in 1981. He spent 11 seasons with CSKA Moscow, the famed Red Army club, and won the Soviet MVP award three times. In 1989, Makarov was signed by the Calgary Flames. The team drafted him in 1983, taking him 231st overall. In his debut season, his shooting percentage was a league-leading 25.9 percent and he managed 86 points in 80 games. He also played for the San Jose Sharks before taking on a brief stint of four games with the Dallas Stars. Vachon first entered the NHL as the backup goalie for Gump Worsley of the Montreal Canadiens in 1967, but he really cemented himself as a star in the playoffs. He led the Habs to the Stanley Cup Final, where they lost to the Toronto Maple Leafs. Despite the loss, Vachon was a formidable netminder and he started 39 games the following season. He secured the Vezina Trophy alongside Worsley, with a combined 2.26 goals against average. Under his watch, the Habs picked up two Stanley Cups. He was traded to the Minnesota North Stars during the 1969-1970 season, where he was the starter until the arrival of a rookie Ken Dryden in 1971. Vachon asked for and received a trade to the Los Angeles Kings, where he really took off as a career netminder. Vachon set many team records for the Kings, including the most career games played by a goaltender. Jonathan Quick recently surpassed some of his records, however, but Vachon still stands as one of the best all-time franchise players. He also never allowed a goal on a penalty shot, thanks in large part to an amazingly quick glove. Finally, Quinn’s induction goes without saying. Inducted into the Builders category, the big Irishman served as a long-time coach after nine seasons as a hard-nosed player. He joined the Philadelphia Flyers as an assistant in 1977 and held coaching, management and presidential positions in the NHL for the next 40 years. When he passed away in November of 2014, Quinn was the Chair of the Hockey Hall of Fame. In 20 seasons as an NHL coach, Quinn won the Jack Adams Award twice and secured 684 career wins behind the benches of the Flyers, Kings, Vancouver Canucks, Toronto Maple Leafs, and Edmonton Oilers. He reached the Stanley Cup Final twice, coached Team Canada to gold at the 2002 Winter Olympics and was responsible for many iconic management decisions. Among them, Quinn brought franchise netminder Kirk McLean to the Canucks and drafted Trevor Linden and Pavel Bure.